Utilize the new Interportlet Communication (IPC) feature in Dashboard Builder 3.1 (and within BusinessObjects Enterprise XI 3.1) to pass data between Xcelsius 2008, Web Intelligence documents and Crystal Reports. Through the use of “Content Linking”, this type of communication can now take place between the products listed above – all within the same Dashboard Builder portlet. The steps below will walk you through the incredibly simple process of linking an Xcelsius model (used as the source) to two Web Intelligence documents as targets. Not only can Xcelsius be used as the source analytic but it can be the target as well. Content Linking and IPC allow for linking to take place between two or more Xcelsius models. Let’s start by creating a prompted Web Intelligence report. In this example, I will be using the Islands Resort Marketing Universe (that comes packaged with BOE XI 3.1) to create the report. The screenshot below is from a simple Web Intelligence report with a filter added for the Country field and set to Prompt for input. The name of the filter (or text of the prompt) has been changed to “COUNTRY”. 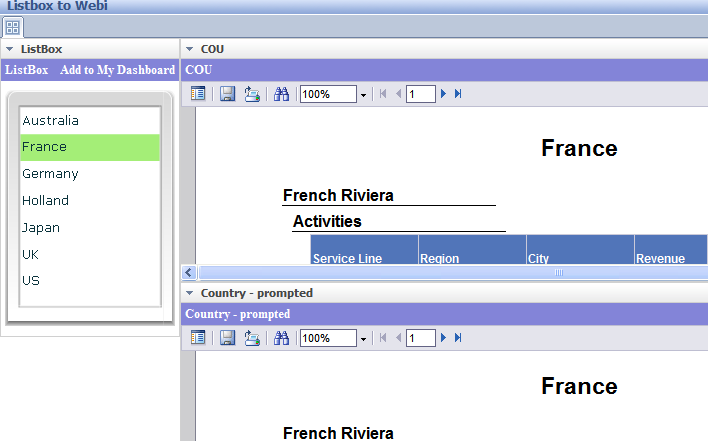 In the next step, I will create a very simple Xcelsius model that features a ListBox loaded with countries. 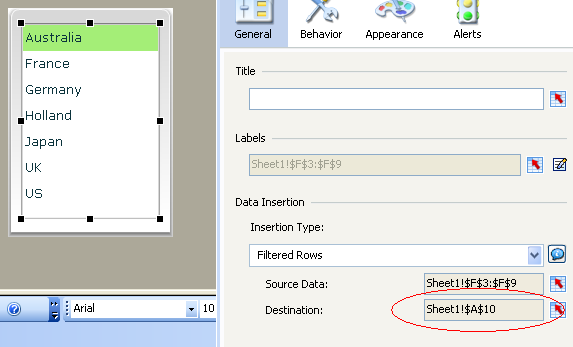 When one of the listbox items is selected, I will pass the filtered row value to the destination cell A10. 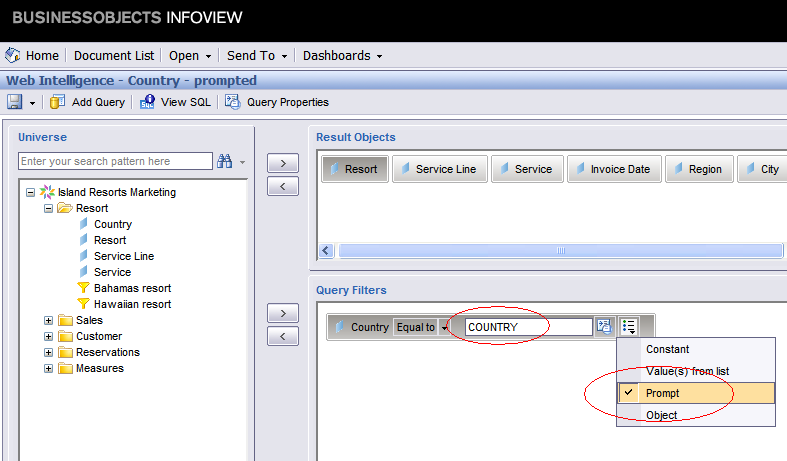 The next step is to setup the query parameters to allow Xcelsius to pass data to another reporting tool. From the main menu, click Data -> Connections. Click the Add drop-down and select the FS Command connection type. In the Command box, enter the single word: queryparams. In the Parameters box, point to a cell that concatenates the lsS[Name] parameter with the value to be passed to it. Refer to the screenshot below. A. In my example, the name of the prompted filter is COUNTRY. This means the parameter name that will be placed in your spreadsheet is lsSCOUNTRY. B. Assign the destination cell to the parameter name, similar to: lsSCOUNTRY=A10. D. The screenshot below contains the following value in cell A9. “&lsSCOUNTRY=”&A10. This formula concatenates a literal parameter name to the dynamic value selected in the Xcelsius model. The assignment of the value is made within the Web Intelligence document. It’s now time to add both of these report objects to a dashboard – or more specifically, to a Dashboard Builder 3.1 portlet. 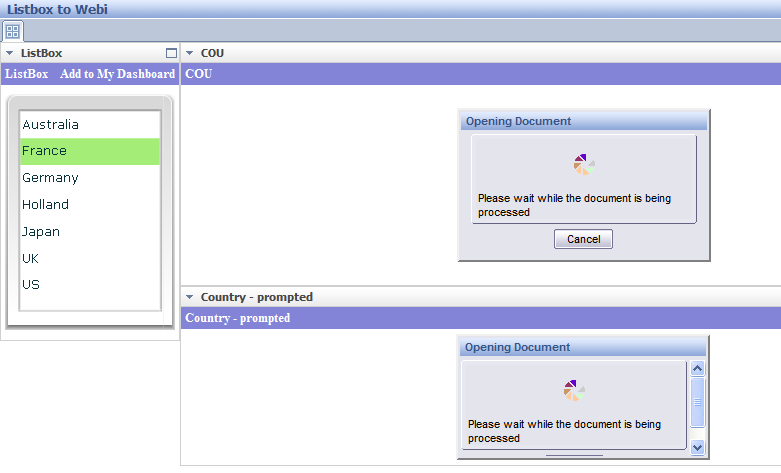 Either select (Create Corporate Dashboard) or mouse-over Corporate Dashboards to select an existing dashboard to edit. I will be editing an existing dashboard. If you have the proper permissions, you will see Edit Dashboard in the upper-right corner of the screen when a dashboard has been selected. 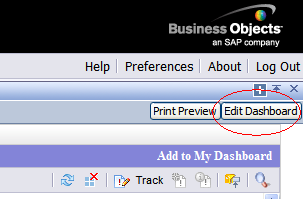 If you select Edit Dashboard, the Analytic Toolbox will open and appear on the top of your screen. The Corporate Analytics folder contains all of your published BOE XI 3.1 report objects (that you have permission to access). You’ll see below that a Web Intelligence report called “Country – prompted” and an Xcelsius dashboard called “ListBox” have been circled. These are the two objects used in our example. Once “ListBox” and “Country – prompted” have been placed on the dashboard, click Content Linking to enable Interportlet Communication. Below is the screen you will see after clicking Content Linking. 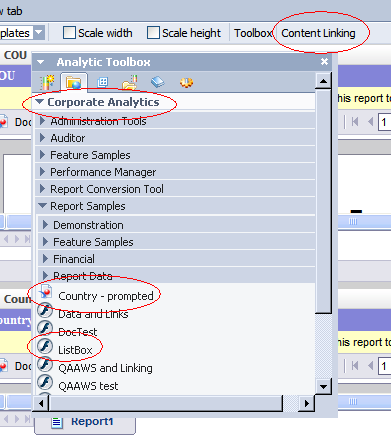 A drop-down menu is provided to allow the Source Analytic to be selected and the remaining items become available in the Target Analytics section. Two identical Web Intelligence documents were added to the dashboard, COU and Country – prompted. Both Web Intelligence documents have been selected as the Target Analytics. 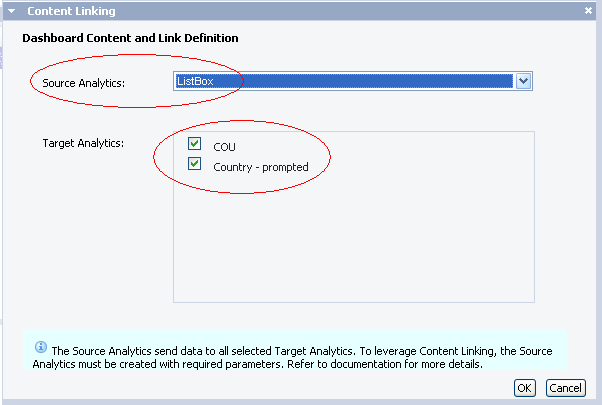 By setting up Content Linking, every time an item in the Xcelsius listbox is selected, the value is passed to the prompted Web Intelligence filter as “&lsSCOUNTRY=[clicked item]”. After receiving the parameter(s), the Web Intelligence documents (or Crystal Reports) are immediately refreshed. The screenshot below shows both Web Intelligence documents being refreshed at the same time. The event will take place every time a new country from the Xcelsius ListBox is clicked. Both reports are refreshed and contain France data. If the Web Intelligence reports were created from an aggregate universe or highly optimized fact table, the reports will refresh very quickly ensuring user interest and acceptance. Please feel free to contact me with any questions or recommendations. Thank you! Click here to see Jim’s Profile. How to show trends in Xcelsius Dashboards? Posted in: Articles, Crystal Reports, Training, Xcelsius 2008. Our company has just purchased the BOBJ suite with the intent of building manager dashboards and at this point we’re just getting off the ground, so some of these questions probably do nothing more the demonstrate my ignorance at this point. I’m guessing the scenario of selecting just a Country in Xcelsius to pass to 2 WebI rpts is just to demonstrate the IPC functionality, rather than trying to suggest this use Xcelsius as a tool for such a simple input mechanism. I could see where it could make sense to do this where you were using Xcelsius to pass a more complicated set of input values. I’m also curious to get a sense of where Dashboard Builder is going. I had sat thru a webinar that tried to explain what types of analytics were approriate for Xcelsius and where Dashboard Builder was appropriate, but had also seen information that suggested that Xcelsius was to be the tool to use going forward. However, this IPC seems like something that clearly maskes Dashboard Builder a major component of creating analytic solutions. So what do you see the roles of these two products to be going forward? The FS Command under USAGE needed a trigger cell when I tried this example. I bounded the “When Value Changes” to A10. Any thoughts on how we can get the default selected value in the list box to be selected on the dashboard page load? J’ai suivi attentivement ce tuto très intéressant. Ma question est la suivante : peut-on réaliser la même chose en version BO XI R2 ? Précisément, j’en suis arrivée à l’étape du “Content linking” (lien contenu), que je ne trouve pas en version XI R2. I followed this tutorial very interesting. My question is: can we achieve the same thing in BO XI R2 version? Specifically, I have come to the stage of “Content linking” (link) that I do not XIR2 version. No, you can’t do this with BO XI R2. This IPC capability that includes the “Content Linking” was added with BOE XI 3.1. So if you want to use it you have to upgrade to BOE XI 3.1. I have done everything that is mentioned. So I placed &lsSD= in the parameters cell. I then placed it in the dashboard and I did content linking. I just am not able to link the two reports. This is assuming that A10 is the destination cell that your Xcelsius component will insert data into. Also be sure to type the words queryparams in the Command box. If you add this formula in Excel: =“&lsSD=”&A10, you will see: &lsSD=. That is all you will see. But when the the Xcelsius document is executed and an item is selected from your Xcelsius component (that has a destination cell of A10), the cell will now read &lsSD=TEXAS (or something like that). Hello, This is really useful. Is there any limitation on the number of parameters passed.? Why do we have the name as “Queryparams”. Is there any specific reason. Thanks. 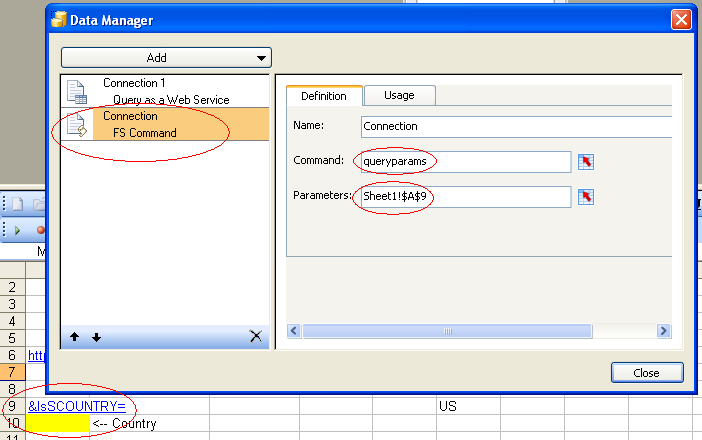 i have on scenario to link a webi in webi and analytic to webi. 2) using prompt and non prompt. hei..why i cann’t link the xcelsius value to webi. when i click the swf file,webi file didn’t do anything. Its like xcelsius and webi doesn’t have link. pls let me knw ..
Hello. Great job, if I wasn’t so busy with my school work I read your entire site. Thanks! I was trying this for 6 hours, and I was only able to do it when I read your article. The Dashboard Builder Guide is not that clear on what should be put in the parameter option of the FS Command. i did the same thing wht ever u mentioned,but im not getting ..the value not passing..i.e my report not been getting refresh…could you pls ans my issue pls..
1.do i need to save report as “refresh on open”? How far would the prformance of a dash board be affected, say if i am passing 50-60 parameters from xcelcius dashboard to a WEBI report. Assume that I have very limited data exchange between other components on dashboard. Please let me know if there is any way to implement Content linking in the reverse manner i.e. using Web intelligence as the Source and Xcelsius as the target. Have searched on forums and the PDFs but all state Content linking using Xcelsius as the source and Web intelligence as the target. To be able to pass a parameter(s) from the Web intelligence report for which we would be using objects from the universe & accordingly the visualisation (Eg. charts) should change in Xcelsius. The idea is to be able to use data coming from an existing universe, passing this value as a parameter to Xcelsius(for which QaaWS queries are already written & pulled into Xcelsius) to be able to achieve the visualisations which Xcelsius offers. In short, to do away with writing Excel formulae in Xcelsius for data coming through QaaWS. Pls let me know if you have any idea about the above. Could you please help me with values passing from one webi report to another webi report using IPC method (Content Linking method). I have tried with Xcelsius to webi, which works fine. I would like to know from webi to webi using content linking method. Thanks in Advance. I also spent over 4 hours trying to get this working with no success until I stumbled across your article. Worked like a charm. Is this written somewhere in the BOBJ documentation? I couldn’t find it. I followed the directions, but when I select a value from the Xcelsius model, the webi report does not refresh. We are on BO XI 3.1 (FP 2.5) and Xcelsius 2008. We followed the steps outlined in your blog, when we click on any of the countries then we are getting 404-/ull Error message. Do you know why this might be happening ? we are on BO XI 3.1 (FP 2.5) Xcelsius 2008. I type “&lsSD=”&A10 in excel cell , but I get error and dont see &lsSD=. plz help me if i need another soft ware. Thanks for the tutorial. When I select a value from Xcelsius the Webi report refreshes but it doesn’t use the parameter that I’ve just passed. Is there any way I can monitor what is being passed and what is being recieved (beyond taking a snapshot of the excel data)? hi i would want know how you can have several prompt in xcelsius with a connection live office with webi. i tried this but i am unable to get. Webi report is getting refreshed but the selected parameter is not passing to webi report. i have taken City as pompt from efashion database. this is the urgent requiremet. Please sent the .xlf file who were succeeded to open the webi report from dashboard.